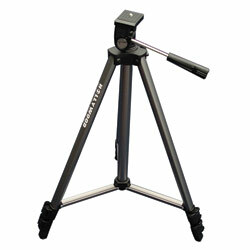 This Adjustable Tripod can be used to mount our Infrared Control System, Model 63501IR and is also part of the Modified Bassin Anticipation Timer, Model 35580. For more information about the Infrared Control System or the Modified Bassin Anticipation Timer, view the RELATED PRODUCTS tab. This battery-powered photocell is ideal for outdoor timing. It is designed to generate an infrared beam. When that beam is broken, a relay is closed and a signal starts a series of clocks or counters.